After the victory at K’Tithrak Mang, things are looking up for the Confederation. Several Kilrathi planets are rebelling and breaking away from the Empire. The Special Operations division of Confed is assigned to support the Kilrathi rebels and protect them from the inevitable Imperial counterattack. That's not the only problem, though: after a mutiny on a Confed cruiser, the crew have taken to piracy and attack human trade ships in the nearby star systems. The first add-on to Wing Commander II offers 20 new missions. It also offers new ships: the Crossbow is Confed's latest bomber, faster and more maneuverable than the Broadsword. The new member of the Kilrathi fleet is the heavy fighter Gothri. The story of Wing Commander II is continued with lots of cutscenes, featuring old and new characters. Player characters from the original game (and their kill scores) can be transferred into the add-on. 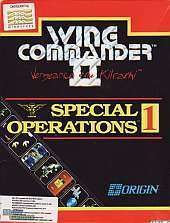 When The Kilrathi Saga was released, Special Operations 1 and 2 were made available for download from the Origin web/FTP site.